LODRA is a revolution in the field of Safety Led lightline installing technique. It can be used for many applications, such as traffic, industry and safety, but also in the decorative market. 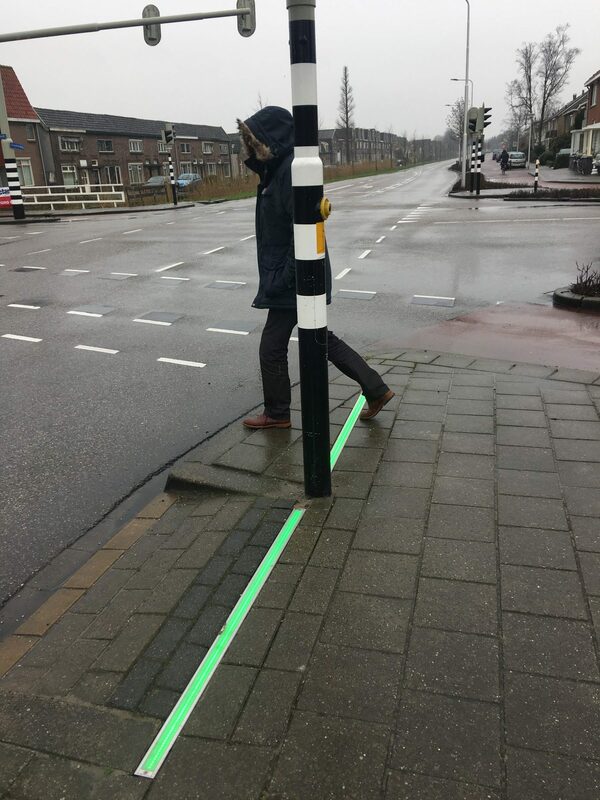 LODRA is a led lightline that gives a much clearer signal to traffic participants than current interrupted in-pavement LED markers. Its contrast and non-stop light technique generates a sharp and clear line, making it suitable for many safety situations, but also for decorative applications. Its brightness is clearly visible in daylight situation. Built-in light sensors automatically dim the intensity of the led light unit, to avoid disturbance in the evening and during the night. It is also possible to dim the light unit manually. Depending on the preference, this can be done in fixed steps or infinitely. LODRA is an RGB- led lightine, so any color is possible. This will enable our customers to choose the color that best fits their application. Another option is to apply multiple colors in one line. every 2 cm or even generate a completely different color. This makes the lightline unique and appropriate for multiple situations. The LODRA lightline is a built-in application. Its unique design ensures that there is no incline versus the surface where it is used (e.g. pavement, flooring, loading docks), so it will not hinder anyone. The unit is made from high quality aluminium, which rules out the chance of corrosion. The lens is made of layered and scratch-free glass, making it conform IK-10 standards. IK-10 is the highest degrees of protection provided by enclosures for electrical equipment against external mechanical impacts. It is therefore suited for use in heavy loaded conditions like industry, public roads and sidewalks. The LODRA is designed especially for quick and easy installation. The lightline is small in both width and height, which ensures that only a limited amount of material must be removed from the surface where it is placed. Subsequently, the unit can easily be placed at the same level as the surface and moulded if necessary. Every LODRA is provided with a 7.5-meter cable, which, in most cases, avoids having to make a weld. The electronic components, including the LEDs, are completely sealed which makes them 100% protected against moist and dirt (IP68). The unit can handle temperatures between van -20°C and +60°C. Optionally even +70°C is possible. Since the controller is close to the LED strip inside the unit, it will not disturb the communication between the controller and the LED. The configuration of the LEDs in the LODRA is redundant; this means that in case 1 LED fails, the remainder of the LEDs will keep functioning. The unit itself will generate a failure report. The software of the LODRA is developed in such a way that it can communicate with virtually every protocol available. Therefore, it can be integrated easily in existing light control protocols, whether it is used in traffic control systems, theatre lighting or building installations. 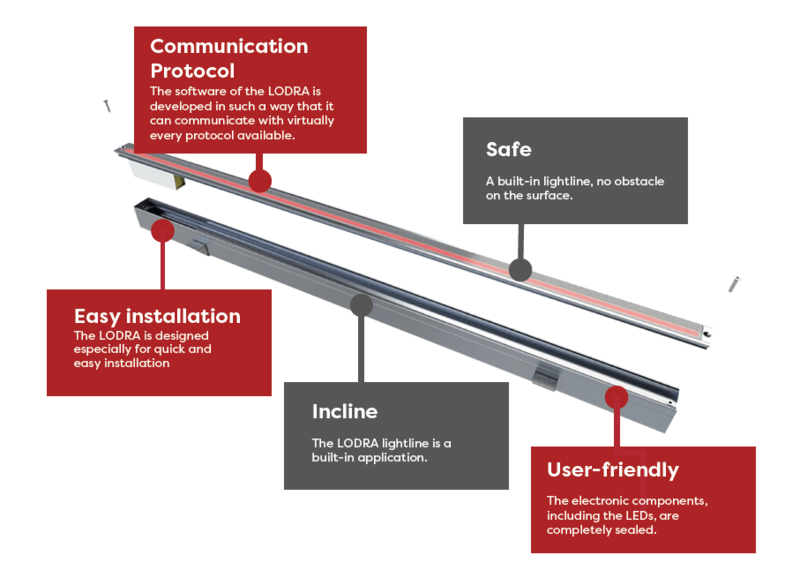 The LODRA LightLine is a ‘sealed for life’ product and does not require specific maintenance during its lifetime. In a worst-case scenario (LED failure) it can be easily repaired; both the LED and control unit can be removed from the topside. There is sufficient cable available to replace the unit if necessary.The lightline is available in sizes from 60 cm until 3 meters, allowing for any desired length. As the units can be interconnected, the lightline is virtually seamless.